A cockatoo can sometimes exhibit problem behaviors. 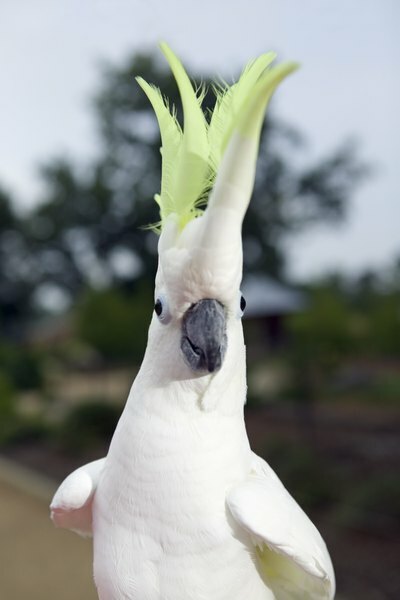 Cockatoos can be intelligent, playful pets, but their strong personalities can also get them into trouble. If your cockatoo is displaying bad behavior, don't just blame instinct or bad habits. Get to the bottom of what's bugging your bird so you can help him turn into a well-behaved avian companion. Feather plucking is common in cockatoos, and can range from the occasional pulling of a bothersome tailfeather to full-on self-mutilation that leaves bloody scabs on your bird's body. Boredom is a common cause of plucking behavior, so increasing his level of stimulation can help. To curb plucking behavior, spend some extra time playing with your cockatoo and give him plenty of toys to play with when you are away. Before you ascribe his bad habit to boredom, though, have him checked out by your vet to rule out medical causes of plucking, such as mites or skin allergies. Cockatoo rescue organizations sometimes see otherwise friendly and loving birds given up because they scream or screech too much. Don't banish your bird for this perfectly natural behavior, though. Cockatoos are naturally one of the loudest of all the parrot species, so you should expect a bit of noise from your bird. They tend to be especially vocal at dawn and dusk. Keeping your cockatoo in a room with other people or pets can help reduce screaming because an isolated cockatoo will instinctively call out loudly for his flock. Providing flapping exercise sessions, easy access to chewable branches and frequent long showers where your bird can relax can also help make him a calmer, quieter bird. Biting is not a natural behavior for your cockatoo, and birds in the wild rarely use their beaks for fighting other flock members. Although it seems like yelling at your cockatoo when he bites you would get him to stop, it actually encourages him because screaming is a natural behavior he thinks is fun. Instead, the way to discourage biting behavior is to calmly say the word "no" while frowning. An empathetic cockatoo will recognize this as an expression of displeasure. Immediately after the calm reprimand, make the bird walk from one hand to the other, a technique called laddering. Laddering is a negative experience in the bird's mind, so your cockatoo will want to avoid the biting behavior that leads to it. Some cockatoos start to rule the roost if you let them get away with it. In many cases, misbehavior isn't truly dominance, but is just your cockatoo's way of avoiding doing what you want him to do. Gentle persuasion, in the form of making the desired action more fun, is far more effective than forcing your cockatoo to do something. For example, if he resists leaving a high perch to return to his cage, providing special attention before you put him away and leaving a favorite treat in the cage for his return will make him more amenable to coming down the next time. You can also practice the desired behavior at times when it isn't as important, so he will learn to do what you want in a stress-free, reward-rich environment.